Thirteen members of the OSU Extension Sheep Team traveled to the states of Idaho and Utah during October 5th –10th to learn about sheep production in the western ranch model. Before anything else, many thanks should be given to Paul Kuber, OSU Extension meat science specialist, and Troy Cooper, OSU Extension Educator in Knox County for their work in setting up the tour stops and making lodging arrangements. Those participating in the trip included, Dr. Paul Kuber, OSU Animal Sciences, Roger A. High, OSU Extension Sheep Program Specialist, Troy Cooper, Knox County Extension Educator, Gary Wilson, Hancock County Extension Educator, Jeff McCutcheon, Knox County Extension Educator, Rory Lewandowski, Athens County Extension Educator, Tim Fine, Miami County Program Assistant, Woody Joslin, retired Shelby County Program Assistant, Bob Hendershot, USDA-NRCS Grasslands Specialist, Leah Miller, Executive Director, Small Farm Institute, Ivanette Susin, Visiting Professor, University of San Paulo, Brazil, Curt Cline, Athens County Sheep Producer, and spending a short amount of time with the group, Bill Shultz, Logan County Sheep Producer. We had the opportunity to visit with commercial sheep producers, veterinary professionals, experiment station researchers, marketing cooperative members, and wool marketing managers to educate us on western sheep production. While the production system is different than sheep production in Ohio, I found that some of the issues and challenges to western sheep production had similarities that Ohio sheep producers could identify with as well. One fact that became very clear during visits with ranchers and sheep professionals is that western commercial sheep production is based on the use of public lands. Unlike Ohio where most of our agricultural and forestland is in private ownership, there are vast tracts of state and federally held land in western states like Idaho and Utah. Much of this public land is held by the Bureau of Land Management (BLM) and the U.S. Forest Service. As part of their land management policy the BLM and the Forest Service have permitted ranchers to lease land for grazing rights. The BLM and the Forest Service dictate how and when these lands are grazed, including the number of animal units that must be grazed. In contrast to Ohio where our grazing system focuses on intensive use of land with relatively high animal numbers on limited acres, the western model is more extensive. Animals are grazed on more acres and each acre is used less intensively. For example, we visited Lava Lake Ranch, which owned about 24,000 acres of private land, but held leases for grazing on BLM and Forest Service land amounting to about another 900,000 acres. I don’t remember the exact number of sheep the ranch grazed, but I think it was in the neighborhood of about 6000. Not all of this land is grazed every year. The ranch manager told us that the more intensively used land might get one or two grazing passes/year while other land is only grazed once every other year, and some land is grazed once every third year. When a fire occurs on some of these acres, grazing is lost for at least three years until the land recovers. The environment in states like Idaho and Utah where rainfall averages 7 to 11 inches per year is more fragile than in Ohio. This means that rest and recovery periods following grazing are much longer than what we are accustomed to providing. During our visits with sheep ranchers we heard about 2 basic production models. While both models focused on grazing during the spring, summer and early fall months, the main difference was how the late fall and winter period was managed. In one model, sheep are loaded up into trucks and hauled to California, about a 750-mile trip, where they overwinter. Sheep graze on California alfalfa fields from late November to February. Lambing generally occurs in late November/early December. Once the alfalfa fields move back into hay production, ewes and their lambs are grazed in California foothills until they are transported back to Idaho in April. In the other model, sheep stay at the ranch through the winter. Sheep are brought down from the higher elevations and when grazing ends in mid to late October, they are fed hay. We did talk to one rancher who purchased grazing rights to 134 square miles of land that provided winter grazing for 2000 head of sheep for 5 months. 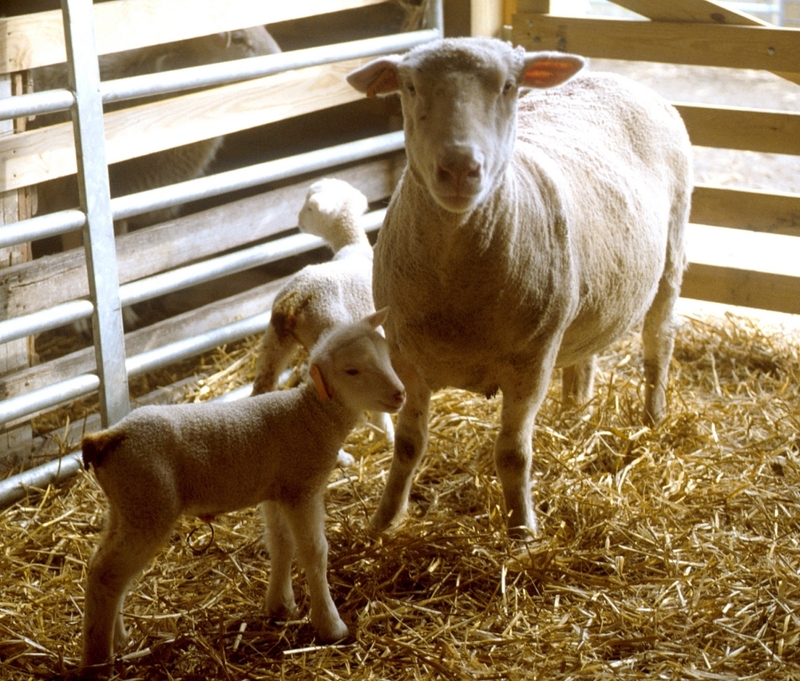 Lambing occurs anywhere from January through March, depending upon the ranch. Lambing sheds are used to provide some shelter from the wind and the possible 20 to 30 below zero temperatures that can occur. The ewe and lamb may only spend 12 to 24 hours in the lambing shed before they are kicked back out into the open lot. In both models sheep are divided into management groups. A typical management group consists of about 2000 head of sheep and is termed a “band”. Sheepherders provide most of the day-to-day labor and management. Traditionally these herders came from the Basque area of Spain, but now are more likely to be from Peru, Chile, Mexico or even Mongolia. Under both models, grazing begins on BLM land in late April/early May and continues through May/early June. Sheep are generally moved every day by the herders. Fencing is non-existent, so bands from several ranches may be competing for grazing space and water. Herders are responsible to keep bands separate and insure that adequate grazing is found. Sheep are next moved from BLM land to the foothills, generally private or state owned land to graze. Lambs are marketed from the range during the mid-June to mid-July time frame. Most of the ranchers that we talked with market a 115 to 135 lb lamb at about 7 months of age. If a ranch has grazing rights on Forest Service land at the higher elevations, this land is available from June 16 until about mid-September. In mid-September, sheep are grazed back down into the foothills through mid to late October, depending upon the year. Even the ranches that transport sheep to California for the winter generally have at least a 2 to 3 week period between the end of grazing and shipping where they feed some hay to the sheep. Then in November, the whole cycle starts over. Almost all of the commercial sheep ranches are also involved in the production of alfalfa hay. The downside is that production is dependent upon irrigation, which is mainly provided by central pivot systems. One rancher told us the cost of water is running at $1200-1300 per acre-inch. The upside is that once the irrigation is shut off and the alfalfa is cut, rain is not a concern and very high quality hay is produced. We drove by field after field of uncovered large square bales of alfalfa sitting in the field or gathered into uncovered stacks. This high quality alfalfa hay is currently being marketed at $250 to $275/ton. Lower quality is valued closer to $200/ton. One of the things about commercial sheep production in Idaho and Utah that surprised me was the size of the ewes. Before I went on the trip I had this mental image of a range ewe as a small, hardy, survive on rocks, brush and a few sprigs of grass type of animal. The ewes we saw, and that ranchers preferred were big ewes with average weights around 200 lbs. Once I heard about the grazing patterns, and saw how the range was managed, I could better understand how a 200 lb ewe could survive in the western environment. Over wintering costs. For those that overwinter on the California alfalfa fields, fuel price has driven transportation costs to record highs and has some ranchers re-considering if they can afford to continue this practice. On the other hand, as hay costs increase, winter-feeding is becoming more costly and driving down profit margins. The availability of the use of public lands for grazing is becoming a bigger issue. Certain environmental groups would like to eliminate the grazing provision on public lands. Some of these groups are competing to buy up leases, driving costs up and decreasing access to public land grazing. Water is always a concern in western lands. As urbanization and land development projects compete for this scarce resource, agricultural production costs increase and/or agriculture use of water becomes more limited. Sheep losses to predators. The ranchers we talked to on the trip cited losses to coyotes, wolves, bears, eagles, and mountain lions. Land prices. Some of the areas we traveled in feature world-class skiing and resort areas. As the rich and famous descend upon the area and decide to purchase land, prices are driven up beyond what livestock or crop farming can cash flow for the land. Business succession. Some of the ranchers we talked with didn’t know if the next generation was interested in taking over the ranch and continuing with sheep production. Other ranchers thought that the next generation would get out of sheep and concentrate on cattle and/or crop production. The changing economic realities will make it difficult for sheep production to continue into the next generation unless there is good planning to pass on the land, grazing rights, facilities and a similar vision/passion for sheep production. Dairies. Many of the ranchers mentioned that they are now competing for acreage and hay with larger and larger dairy herds. Working with the Government. One rancher explained to the group that he works with at least twenty-two different government agencies (between local, state, and federal) to find enough acres for his sheep to graze. The trip to Idaho and Utah was an incredible opportunity to gain a better understanding of a segment of sheep production that is important to the overall sheep industry. While I was amazed at the scope and vastness of the western sheep ranch, I came away with a deeper appreciation of this type of production and I was impressed with the ranchers knowledge of his environment and how it had to be managed to protect and sustain the land. Posted by Braden Campbell at 8:46am January 4, 2019 Posted in Management and tagged Management. Bookmark the permalink.